Not having funds saved for a rainy day is one of the cardinal sins of money management. Did you know that 75 percent of Americans don’t have enough saved to cover their bills for 6 months and over a quarter of Americans have ZERO saved? But how much should you have in that rainy day fund? Reader D dropped me a line the other day asking that exact question. 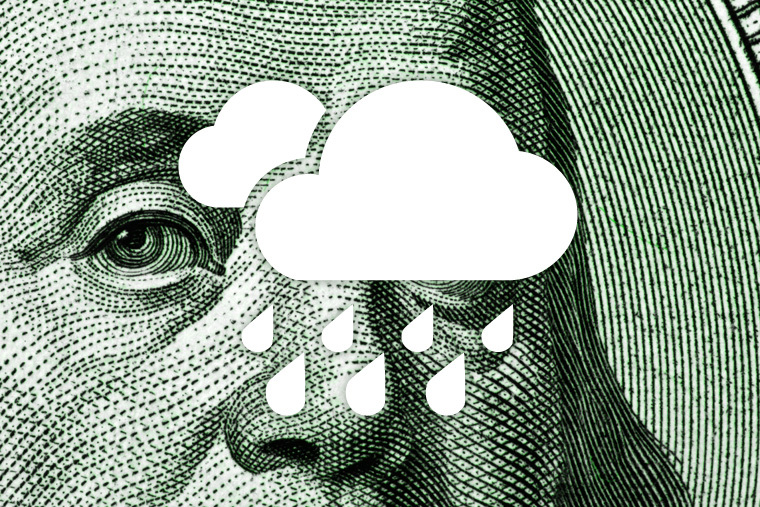 Here it is: How much should you have in a rainy day account in case you lose your job? My husband has about 1&1/2 years saved in an account with Vanguard. That is in addition to our retirement account and checking account (which is about 40 thousand). I want to get a pool but my husband says we don’t have enough money. He said we need to save the money in the retirement account in case he loses his job. I think we need to enjoy today, as long as we have enough in savings, just in case. Thanks for your help. Thanks for your question reader D. Sounds like you and your husband have been great savers! By the way, the rainy day fund isn’t a one size fits all solution, but here are my thoughts. First, you’ll want to have a sizable chunk. It sounds like you do. If you told me that you only had a thousand bucks set aside I would most certainly tell you to put the pool on hold until you got to a more secure level of rainy day savings. But the pool is a possibility because of your hard work and dedication to savings. Your lifestyle reflects a commitment to saving for the future. The fact that you are asking the question and thinking through it speaks volumes too. Second, what are your circumstances? You mentioned your husband was intent on growing your emergency savings specifically because of job worries. How realistic are those worries? If he is just always scared of the “what if” but in actuality his job is very stable then the pool isn’t a crazy idea. If his employment is unstable and his job really could be cut at any moment, then your sizable rainy day fund should be kept in tact for that likely scenario. We don’t want your husband to be on pins and needles because he doesn’t feel well prepared for the loss of a job that could happen soon. Third, personality matters. It also sounds like your husband is super cautious – but I’m just guessing from your short e-mail! The level of cash you have in savings sounds like a good amount to me. Life shouldn’t be “all about the future.” Enjoying some of the fruits of your labor now is important. Maybe you guys should sit down, have a chat, and talk about your goals. A pass to a local pool might be a great get for this summer and you could work towards getting your own pool for next summer. Compromise is key in any relationship and this sounds like a good opportunity for that. I hope that helps. Good luck sorting through these things together. And remember, you have both done incredibly well to save this much for your future. That is a wonderful thing. Also, different personalities view things differently. That doesn’t necessarily make one person right and the other wrong. So a good discussion with some brainstorming of pro’s and con’s could be a great thing for you as a couple. Since I will be making the switch to being self employed, I definitely want us to have a fairly large EF. You never know what will happen since our income will be unstable! I would totally do the same if I were you Michelle. Being self employed means a lot of extra responsibility in the rainy day fund category. Last year had a lot of changes for me (move, and better job & benefits). As my income’s increased. I’ve wondered if a set amount can function for two purposes and the purposes toggle when/if necessary? or will it create a tough situation to pull it from those purposes when it’s be needed as an emergency? I’ve set up an IRA ROTH, to contribute beyond the 401k match available, and a 2nd savings account to put a set amount aside to buy big items (car/wedding) with cash in the future. I consider the sum of three accounts (IRA & 2 savings) can function as an emergency fund if it’s needed, until my 1st savings is funded to my satisfaction. That way, I can use time by setting smaller amounts aside today and giving it more potential to grow for future goals. That is a great way to save, Sara. I consider my Roth to be a “possible rainy day fund” as well. I certainly like to have some in cash, but with the puny savings rates right now I don’t want very much there. That makes the Roth, where you can take out contributions at any time, a great place to store a lot of your rainy day fund. I hope I’ll never have to pull anything out. But it’s there if I do. Great comment and great job saving for the future!